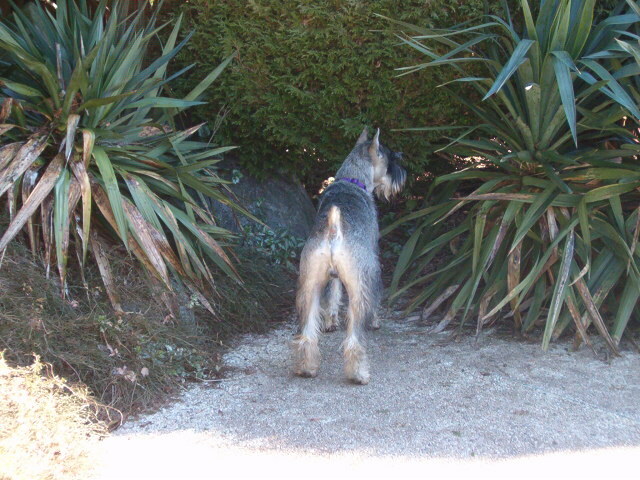 No standard schnauzer should be abandoned to a pound or to the SPCA. The Standard Schnauzer Club of Canada will assist in finding a new home for a standard schnauzer in need. If you are interested in providing a "forever home" to a standard schnauzer in need, please contact our Rescue Coordinator. Rescue situations occur when the Standard Schnauzer Club of Canada is presented with a standard schnauzer that needs a new home. Do not assume that there are any problems with these dogs necessarily, as the cause is often due to a variety of life situations that have absolutely nothing to do with the rescue dog in need of finding a new home. The reasons for a dog being placed into a rescue situation include such things as a family split up, relocation or even to do with an owner illness. Or, the owners for some reason or other are just not able to apply effective training measures. The advantages of your considering adopting an older standard schnauzer include that you may receive an already fully trained dog, which can be a huge advantage in some situations. Puppies require hours upon hours of close care and basic obedience. On the other hand, rescue dogs can be a very and most formidable training challenge. Older dogs are always screened carefully by the Rescue Coordinator and rescue contacts throughout various parts of Canada. They are thoroughly assessed - and only then will they be placed into appropriate home situations. Don't expect miracles in the first week or two, but you will see that these dogs can quickly adapt to you and your family, it's amazing. And you always have the support of the Standard Schnauzer Club of Canada if things do not work out, which is truly rare. If you find yourself in a situation where you cannot keep your standard schnauzer (or know of someone in that situation) - you should know that it is generally best to contact the original breeder. If you have lost touch with your breeder over time, please contact the Standard Schnauzer Club of Canada and all efforts will be made to assist you. The process of rescue and re-housing includes a questionnaire to the original standard schnauzer owner, and a questionnaire to potential adoptive homes (see below). This is of benefit to the adoptive owners and to the standard schnauzer in need of a new home. Efforts are always made to ensure that the transition is easiest and best for all involved. So...Do you Really Want to Adopt a Standard Schnauzer? To adopt a rescue standard schnauzer (a forever home): You need to fill out and E-mail only one of the forms below, to our Rescue Coordinator (instructions are on each form). To provide a foster home (a temporary home) for a standard schnauzer in need, please contact the SSCC Rescue Coordinator with details as to your contact information, your facilities available and other pets/home/children situation that you currently have. In the subject line of your e-mail...please add in your town/nearest large city. Thank you. Please note that the SSCC re-housing service is offered for residents of Canada only. If you are not able to contact our club Rescue Co-ordinator as listed above, please see our Club Information section to contact any of the current Standard Schnauzer Club of Canada board members for emergency interim assistance, or the webmaster. Donations to our rescue fund are always most gratefully appreciated, and will be acknowledged. Contact the club's Treasurer at our Club Info link. Donate today!